These addictive pancakes are almost crêpelike in their crisp and chewy texture. That texture—crisp on the outside, tender and chewy on the inside—is best if you use half rice flour, which is pretty easy to find these days. Serve the pancakes hot or at room temperature with a mixture of soy sauce and rice vinegar. Other vegetables you can use: corn kernels, radish (especially daikon), or broccoli. 1. Mix the flour, eggs, and 1 tablespoon oil with 1 1/2 cups water until a smooth batter is formed. Add the scallions, chives, carrots, and squash and stir to combine. 2. Heat a large nonstick skillet over medium-high heat and pour in about 1/8 inch oil. When it’s hot, ladle in a quarter of the batter and spread it out evenly into a circle. Turn the heat down to medium and cook until the bottom is browned, about 5 minutes. Then flip and cook for another 5 minutes. Repeat with the remaining batter, adding more oil if necessary. 3. As the pancakes finish, remove them and, if necessary, drain on paper towels. Cut into small triangles and serve with a soy dipping sauce. 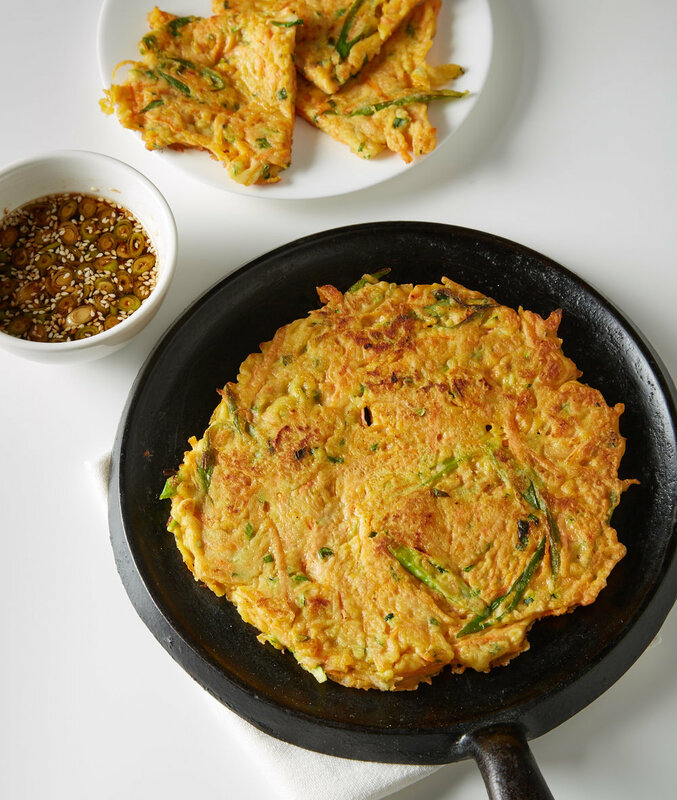 Crispy Kimchi Pancakes: Spicy: Use kimchi liquid in place of some or all of the water in Step 1. Add about 1 cup chopped kimchi to the batter. Japanese Vegetable Pancakes (Okonomiyaki): These large pancakes make a spectacular entrée: Use only 1/2 cup flour and increase the eggs to 6. Use 5 to 6 cups total shredded green cabbage in place of the chives, carrots, and squash. Fry in pan-sized pancakes or smaller-sized. Serve with a chile mayonnaise (mince 1 canned chipotle and a little of its adobo sauce; stir into a cup of mayonnaise and season with salt and pepper).